The 3/4" paw print and American landmark printed neck straps are great! Not only for school student, traveler or charity organization fundraising, they are great for individual or personal fashion ID neckwear too! Getting tired of your everyday wearing ID card or name badge holder? The cool paw print neck straps, neck bands or neck ring lanyards will be your great substitute. 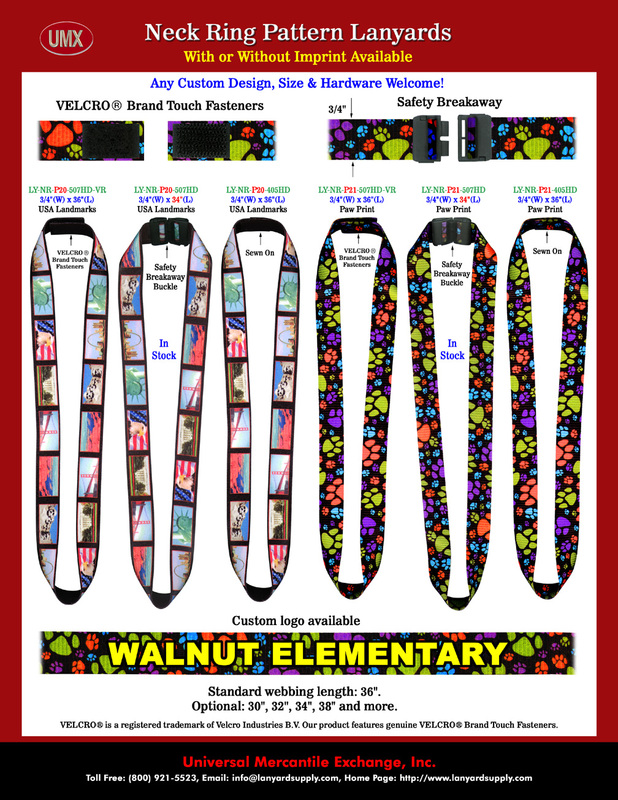 Direct sewn-on neck straps or Velcro® safety breakaway model will need to custom order. But the safety breakaway buckle style - LY-P#-507HD we can make it and ship it right away. An adjustable slider can be added to your order to give you the capability do some adjustment. If you didn't find the right hardware for you, just email us the detail specification and picture, then our R&D department will find the most match one for you. Any custom design, size, length, material, hardware attachment, custom logo and custom imprint are welcome! Safety Breakaway Buckle Models - In Stock - Ships Immediately, Sewn-On and Velcro® Models - Custom Order. You are viewingLanyards > Leash > Neck Ring > 3/4" Paw Print and American Landmark Printed Neck Strap, Band or Ring Lanyards With Safety Breakaway Features.